Turkish journalist Atakan Foça is creating tools, spaces, and infrastructure for citizens to hold media institutions accountable to the verifiable truth. Turkish journalist Atakan Foça is redefining the public’s relationship with the media, turning passive consumers of information into active contributors and fact checkers. Through his organization, Teyit, he is creating the tools, spaces, and infrastructure for citizens to hold media institutions accountable to the verifiable truth. Mehmet's New Idea: Atakan and his organization, Teyit (meaning “confirmation” in Turkish), are defining the new field of digital literacy and strengthening news consumers’ ability to think critically about the information they receive and share. By busting the traditional top-down approach wherein media institutions dictate the news, Atakan is creating a more democratic, crowdsourced, and crowd-monitored process that builds an active and informed citizenry. Atakan’s vision starts by helping people to identify misinformation and hold the related sources and media agencies accountable. Simultaneously, he equips the industry to better deal with a new media landscape (and misinformation) by increasing human capacity at journalism institutions, news agencies, as well as other civil society organizations. Finally, as an incubator, he encourages others to develop tools and innovations that further strengthen the digital literacy of individuals and organizations. Most models advocating for freedom of the press focus on verifying news. Instead, Atakan and Teyit frame the issue as a critical need for basic media literacy in a digital age. Rather than positioning citizens as passive consumers of news, Atakan and Teyit teams are empowering citizens as active agents of a trustworthy news-creation process. In less than two years, Atakan has made Teyit an objective and transparent platform that counters the rising culture of misinformation. As more citizens become informed, and learn fact-checking methods, more media institutions will be pushed to use objective journalism methods and provide accurate information. As a result of his work, many online news organizations have stopped using misleading headlines just to draw attention, while journalists and editors from Turkey’s leading newspapers have started to call the Teyit team before publishing certain news articles. 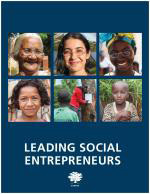 Mehmet' s story appears in the 2018 edition of "Leading Social Entrepreneurs" which features a selection of just a few of the Ashoka Fellows recently brought into the largest global network of social entrepreneurs. The LSE presents some of the newest innovations by leading social entrepreneurs whose ideas are changing the way things are done all over the world.